Actually, I try to do as little as possible. Sounds negative, but I find I can do one or two things well in a timeframe of days, e.g. a week, than many things. It might mean the thing I need to do doesn’t get done for a month, but it will get done. The danger here, is that it’s close to procrastination and I’m not always good at telling them apart. Loved hearing from you..Yes we all try to do way too much..that is what women, mothers do! And we would never, never want to eliminate any of those slices on that pie…but boy would it be nice to figure out how to manage it without turning into a crazy-person! Seems there’s a lot to learn on how to manage it all though, instead of eliminating. I’ll try it first and we’ll see 🙂 Thanks so much for leaving a note Cathy–so glad you like reading! OH, Robin…again and again and AGAIN we are on the same wavelength at the same time. I have been wondering about your writing (I think I was going through post withdrawl), worrying about mine at the same time (nonexistent, thank you), and also re-assessing these same exact questions over the last month or so. I’ve contemplated giving up FB for an extended time (except for my planned weekly posts to my LifeBeats page), making a list of things I do every week and seeing what else I can slash out, and also trying to figure out which “me” things I’ve been trying to fit in are really serving me well and deeply (as opposed to just getting me “out” or “out of my regular life” for a while). Last week, I actually found this quote: “It’s worth remembering…that ‘busy is a decision’ — one we constantly make, and often to our own detriment.” And it really made me think, OH LORD (uh-oh) and at the same time, YESSS. Powerless, but powerFUL, as in I could make the DECISION how I wanna do this. And no one’s gonna get hurt, no one’s gonna suffer, my employer will still think I’m fantastic, and my husband and kids will probably still love me. Hm. Tina, thank you so much for what you added here. You are spot on: There’s this feeling that we need to be so well-rounded. Our kids need to be so as well. And so we just say YES to everything, make it a goal and drive ourselves crazy in the process of making it happen! I think that is what I was doing w/writing–thinking I was failing if I wasn’t able to pull something together every 2 weeks, then 3 weeks, and then I missed a one month and the bells went off, like oh no, does that mean I quit? Failed? I think it just means goals need to be reassessed…I LOVE that you said you missed my posts though! That makes it all worthwhile. And have said it before but think you need to write too! Maybe you should and I”ll post here?? Just a thought. Would love to touch base more often about this on the side–we are connected in so many ways I’ll contact you and we can decide where! THANK YOU!! So great to read this, Robin. THis is my first full week back at work and am I ever struggling. At work, I flit between writing and work-writing, but never really seem to get either done or to be able to focus on either. Meanwhile at home, I’m trying to carve out more writing (i.e. “me” time) but then getting annoyed when my family interrupts me or wants a piece of me, because I feel I have no piece to give. Your post is also interesting because I discovered on my time off that I can’t multitask. At all! And now I know that it’s not a failing. I didn’t really feel it was, but people put such value on the ability to multitask that by embracing the fact that I really can’t I felt defensive. I probably still will because that’s just me, but at least I have the facts and opinions above to remind me I’m on the right path. So, what can I do? I think I will try to set aside a piece of time when I first arrive at work for my creative writing. And again at lunchtime. And maybe 2 nights a week at home. The rest of the time I will have to focus on work or family and see how I go. I really want to write when I want to write and I get frustrated when I can’t, but I will have to cut it down so that the other parts of my life don’t suffer. SL thanks for your great comment–I was thinking of you this week wondering if this new schedule started. Sounds like we are indeed in the same boat! I keep looking at the list going, no, but I don’t want to stop that, or that, or that…but you are right, it’s going to come down to “reasonable” amounts of time spent, and when, on each but trying not to be “caught in the transition” is the part that gives me pause, because that’s where we get a little resentful, and possessive of our time, that keeps us from feeling the benefits of keeping it all afloat. It’s so tough! I’m so glad you made it through your first full week and hope next week goes much better–will be in touch with you soon! Robin, as always, I enjoyed your post. While I’m not struggling with a work-life balance issue, I am working through a “next chapter of my life” quandry, with my daughter now in college and I’m now interested in changing gears professionally. Two things have REALLY helped me and I think they may also help you: 1. Getting enough sleep 2. A daily “centering” activity, such as a walk in the woods or yoga. I opt for the woods for many reasons, but chief among them is the daily reminder that I’m connected to and part of something much bigger. It helps keep my challenges in perspective. Thanks again for taking the time to pen your thoughts! Denise, thanks so much for your comment–you are right, both make a huge difference. 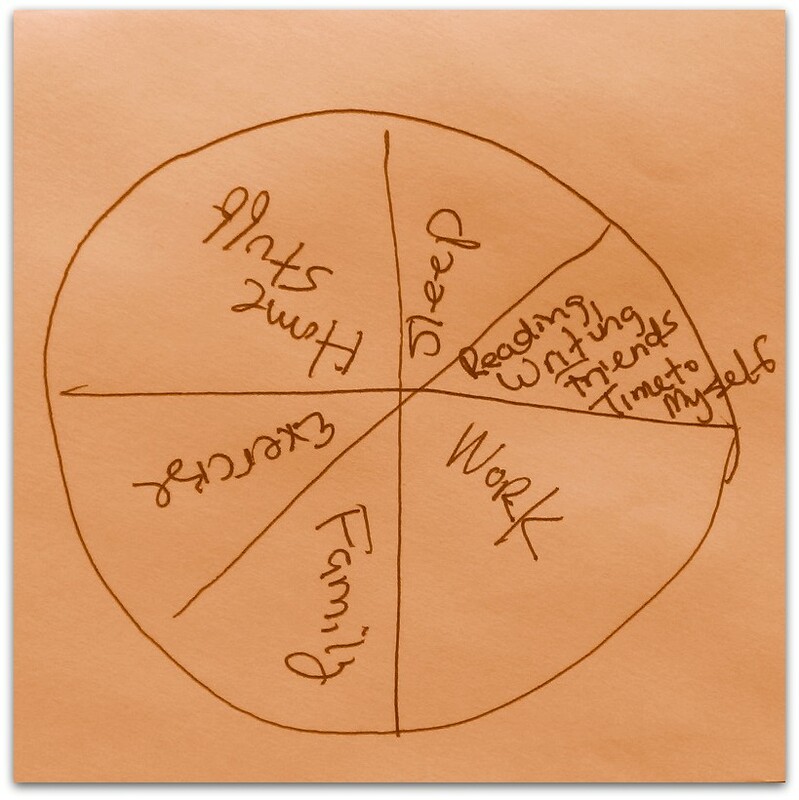 I have been working on the sleep component but sometimes it’s so tough: I am so conflicted because the tradeoff with sleep is usually time alone to chat w/my husband after my son goes to sleep (and so that check mark on the balance wheel gets left blank! ), so lately have been working on staggering that. I was thinking about the “time in nature” part too, as that’s important to me also, but seems I have been in the mindset of that fulfilling the exercise goal but not necessarily the one that helps with creativity and daydreaming–and now that I know this, I think I’ll be looking at this time a little differently. Good luck to you on your next chapter! I look forward to hearing more about your journey! hugs! Hey Robin! Thanks for your article. Over this next month I will have a lot of things changing in my life. I have been a little bit nervous….or rather more scared about what they are going to entail. This article gave me some perspective. I am going to try to focus on the most important things and do it by focusing on one thing at a time. Camilla, thanks for your comment and I’m so glad it helped give you some things to think about. Good luck on all the changes in the coming year! Hi Robin! Thanks for the interesting read about creating balance in our lives and multi-tasking. You always offer a thoughtful perspective! That book sounds very interesting! I wonder if I had heard that author on NPR. I can totally relate to that jittery feeling of running from one activity to another. It doesn’t lend itself well to writing for me. I find that if I am writing, I cast practically everything aside and then try to catch up (in a frenzy) a week later, when my writing is complete. Bits and pieces just don’t work here. And now I am more clear about why! Best of luck to you and you make adjustments in managing your time! Hi Karen, so great to hear from you! I really appreciate the comment. I always hope working through my issues at least helps a few others too. So often we just do-what-we-do, even if it isn’t working for us, without stopping to think it doesn’t have to be this way. I personally don’t feel “busy” is a badge of honor like so many people today. This part about trading creativity for focus–wow, I have been wondering about that forever, since I first graduated from college and went into Marketing. As soon as I learned I was a numbers person, all my visual art skills, something I had from an early age, kind of dried up, and now, here again with shifting back to work and writing. I’m so hoping this helps! And you probably did hear him on NPR–I’ll have to search for that and give a listen. And also finish the book–there’s the part about “organizing the home” I haven’t read that’ll make the husband happy…he’s still waiting for those big piles of paper to go away so we can find things! I am going to check out that book! I agree about busy-ness not being a badge of honor. My kids love their free, unstructured time. They learned that from their parents! I could never be a soccer mom — i would surely lose my mind. Good luck with the papers. I gave the same peoblem! thanks Karen and I do hope we meet in person some day in the future…sounds like we would have a ton to talk about! I agree, Robin! Hope so! I can completely relate. In fact, I’m able to work at home most of the time as well but recently realized that I really need to just go into the office or else I flit from home stuff to work stuff too much. I think the idea of focusing on just one thing at a time makes complete sense although it does feel like we’re “doing” a lot by multitasking… I look forward to reading about how this works for you. I’ll try too and thanks for this today! Thank you so much for your comment Kristi. I forced myself to stop working one day last week at about 2:20, from focused excel work, and gave myself about 10 minutes transition time. I typically turn on the news but this day, I turned on music. Walked out on the deck. Stretched. Cleared my head a bit, and then went to pick up my son (avoiding news like I normally listen to, and listened to music). Have to tell you, the jitteries were much, much better. I felt more grounded, more like myself and ready for the next part of my day thanks to that. But, I think I need to stretch it to about 20 minutes and will try that this week. Have been less successful so far on focusing and not multi-tasking but will tackle this new challenge this week because have a lot of work to accomplish! Will keep you posted!